Information for school leaders and teachers to help support inclusion and deliver an inclusive classroom curriculum. Ko te ākonga te pūtake o te ako. The learner is at the centre of learning. 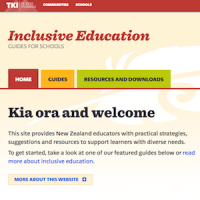 Inclusive Practice and the School Curriculum is a resource for teachers and leaders in New Zealand English-medium school settings. It has been developed to build professional knowledge and create a shared understanding of inclusive practice within the New Zealand Curriculum. It is anticipated that providers of PLD will draw on the resource as they work in and with schools to develop effective and inclusive teaching and learning programmes. Guides with practical strategies and suggestions that take the mystery out of meeting the needs of diverse learners. 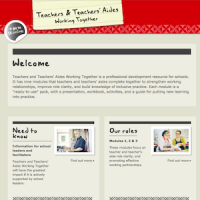 Online modules to help teachers and teacher aides plan and work together in the classroom. 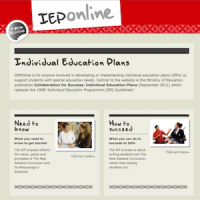 Information for IEP teams on developing individual education plans for students with special education needs.